Things are constantly changing, been added and removed. I'm testing new ideas, experimenting, learning and slowly building my own UI. 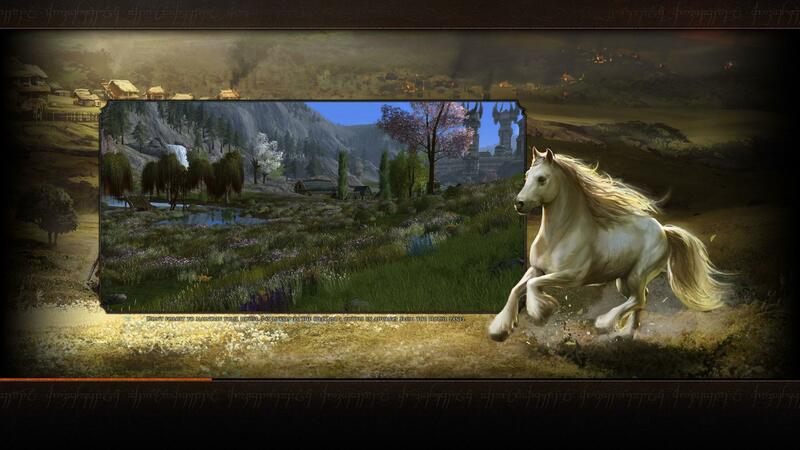 * Changes to almost every window and panel ingame, grafical elements added, removed, modified and put together by magic. 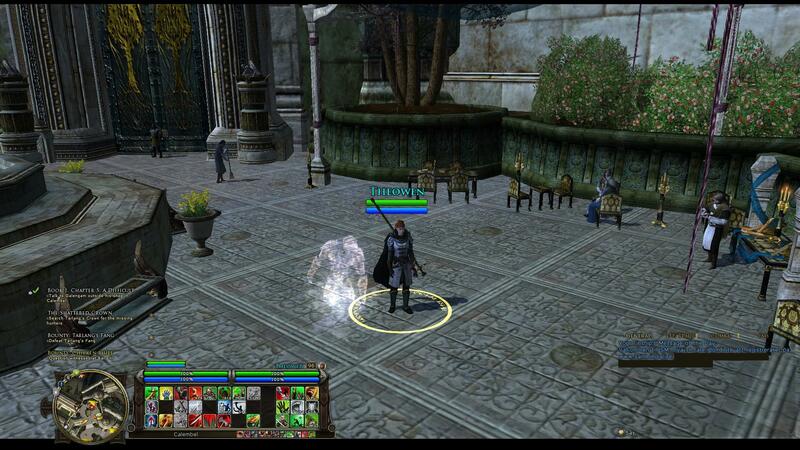 * Removed several MTX-buttons (buttons redirecting you to the lotro store), unfortnaly i cant remove all of them. 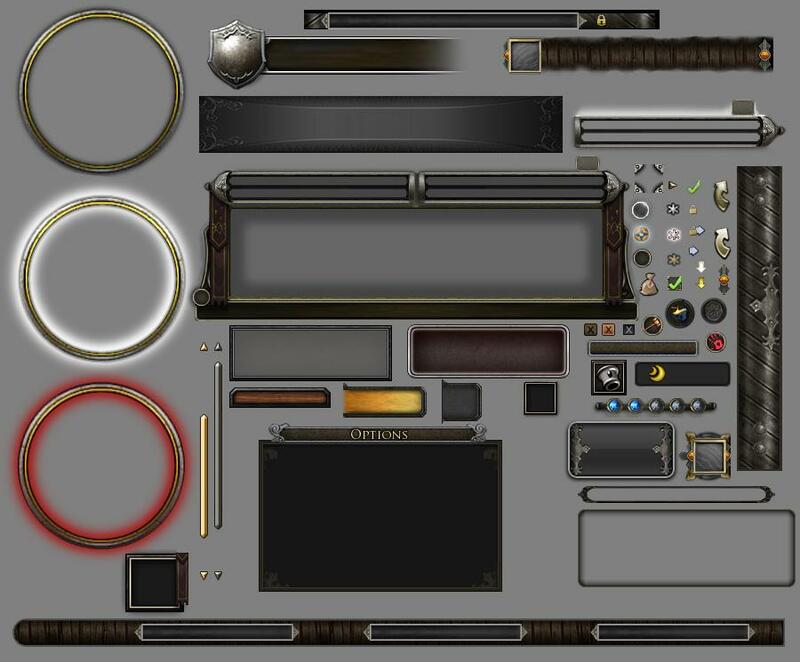 * LOTRO store-buttons removed or hidden from the Wallet, Perks, character journal, apparance tab and some windows i cant remember right now. * Moviebars! just look at the awesomeness! * Changes to the minimap frame to support my new QuestHighlight button and area-name text placed on the mainbar. * new startbutton to match the mainbar. * cleaned up the questtracker icons, slimed down the panel some more. 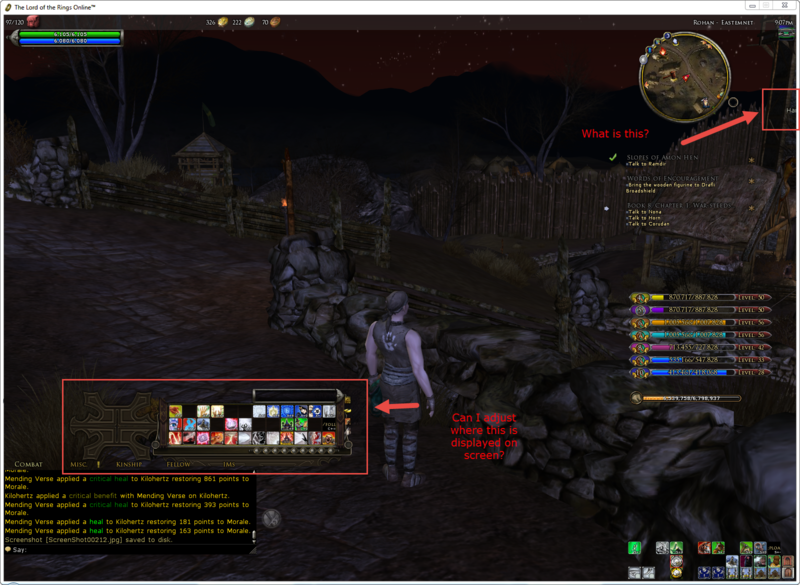 * several lotro-store buttons hidden. * Minor fixes to the new borders and crafting panel. * Changed the Mainbar and startbutton layout and grafics slightly. 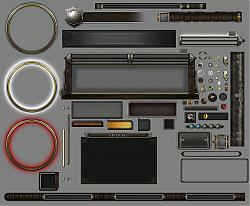 * added shadows to panels, vitals, mainbar and tooltip. * Many fixes and changes to positions and errors. * Changes to the quickslot overlays like OutOfRange icon, higlightning etc. 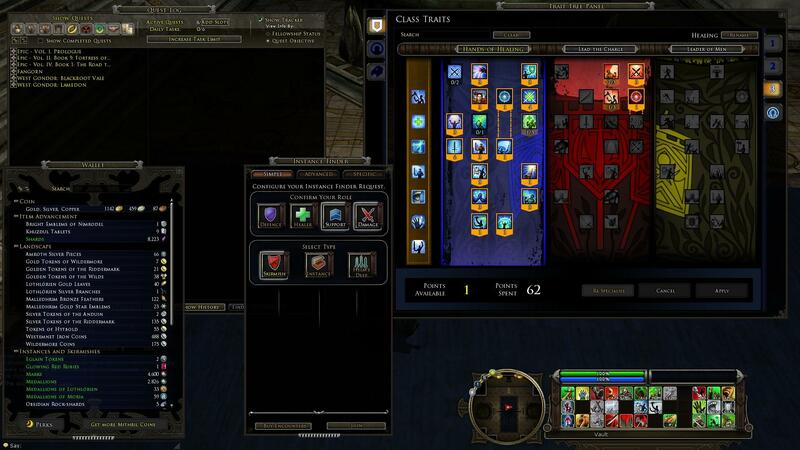 * Bigger windows, many enhancements of the ingame panels like AH, barter, loot, questlog etc from Adra. * Smaller movable panels, like the Radar, Pet panel, quest tracker etc, easier to move freely. * New quickslot layout, you are free to move the vitals however you want but Ive set up the vitals to be above the quickslots and the effect-window appears now beneath, this creates a big gap between them and would look very weird if you did not set it up like i did. * New Vitals - Repositioning a lot of things like the effect window and level-indicator. * New Mainbar - a slim bar with just enough space to hold 3 quickslotbars. * Small alterations to the minimap, like transparency and layout. * after you chosen the Legendary UI of Third Age ingame, restart! * Turn of the 3d portrait in graphic options! you can still excess the group-menu by rightclick your vitals. * possibility to hide the mainbar-buttons, The option is found in UI options, simply chose the "LOTRO store" button as nr 1-7 instead, this makes them invisible. I recommend however to use a quickbar plugin like "Buffbars" or "TonicBars" (i prefer tonicbar). I´ve got no trouble using only 3 bars visible at all times as a captain, while additional bars pop up only when needed. I believe I have addressed a lot of the requests from the community but please feel free to add more! This is an amazing UI that doesn't work anymore. Really would love to see it updated. No news on an update? Anywho, it's still a great skin, though it lacks certain things that make it viable for endgame content. Should those be implemented with a patch, you will have singlehandedly thwarted all other skins on this site for me. And by that, I mean I'd only use your skin because oh my gosh is it an amazing skin. EDIT: Oh and I've noticed that quest items that appear next to your quest log don't work when clicked on. Things like "Use /look" or "Use X item" don't work. Not sure if that's a problem on my end or not, but it's there and I'd figure I'd pitch in, if it wasn't something on my end. Last edited by Thorson : 12-15-2014 at 01:08 AM. I love the look of the UI, but my only issue is there is no xp bar...and if i somehow missed it....where is it? Last edited by Rhyse170 : 12-01-2014 at 12:47 PM. I really like your loading screen! How do you get it to display correctly? I see you don't have a theater_top_bottom.tga there. I've been trying to change the loading screens in a UI I'm trying to build but without that theater_top_bottom.tga - pretty much what you have is what I was looking for a full-screen image, not that top/bottom banner thing like in other skins or the default. I see you have 3 loading_screen files, which do appear to be that screen, but how did you get it to display correctly? I've tried to do the same thing with different images by deleting the theater_top_bottom.tga, or renaming the file I want to theater_top_bottom.tga, but it never displays correctly like yours. Any tips/pointers? Keep in mind, I'm VERY new at making my own UI, so simplified would be greatly appreciated. And I've not seen any tutorials about loading screens, other than how to replace the center image, not to replace the image around the "ad" screens. Could you make a skin only version? Last edited by xaero : 10-30-2014 at 08:58 PM. I really like this UI so far but there is a HUGE problem with it- There are no bars for your currently active buffs and debuffs, both for the player and the target! Am I missing something? This is absolutely vital info. Yup. I vote for a center option, as well. But aside from that, it's a great skin. Very nice to look at, and an amazing loading screen. Mastercrafted, even. That's the only real gripe I have with the skin and the only thing that's keeping me from using it. I love the UI, but would there be any chance to add a "Center" option??? You have a left and right option... How about a center one?